Israeli forces continued with systematic crimes in the occupied Palestinian territory (oPt) for the week of 10 – 16 August, 2017. 17 Palestinian civilians, including 7 children, were wounded in the West Bank and Gaza Strip. 10 civilians, including 2 children, were wounded in the West Bank and 7 others were wounded, including 5 children, in the Gaza Strip. During the reporting period, Israeli forces wounded 17 Palestinian civilians, including 7 children, in the West Bank and Gaza Strip. Ten of them, including 2 children, were in the West Bank, and the 7 others were wounded in the Gaza Strip. Meanwhile, Israeli forces in the Gaza Strip continued to chase the Palestinian fishermen in the sea. In the West Bank, during the reporting period, Israeli forces wounded 10 Palestinian civilians, including 2 children. Eight of them, including a child, were wounded with metal bullets when Israeli forces moved into Abu Shkheidem village, northwest of Ramallah. A child was also wounded with a live bullet during Kafr Qaddoum weekly protest, northeast of Qalqiliya, while another one was wounded with a live bullet in Beit Safafa village, south of occupied Jerusalem. In the Gaza Strip, border areas witnessed protests against the unjust closure imposed on the Gaza population. During these protests, Israeli forces used force against the protestors, particularly when dispersing them. As a result, 7 Palestinian civilians, including 5 children, were wounded. Two of them, including a child, were wounded with live bullets while 5 of them, including 4 children, were wounded with tear gas canisters and sound bombs hit directly at them. Concerning attacks on fishermen, on 11 August 2017, Israeli gunboats sporadically opened fire at and chased the Palestinian fishing boats, northwest of Beit Lahia village, north of the Gaza Strip. An Israeli gunboat surrounded a fishing boat manned by ‘Oday al-Sultan (26) and his brother Saddam (24) from al-Salatin neighborhood in Beit Lahia. The Israeli navy soldiers then arrested both fishermen and took them to Ashdod Seaport after confiscating their boat. The two fishermen were questioned and later released while their boat is still under custody. During the reporting period, Israeli forces conducted at least 46 military incursions into Palestinian communities in the West Bank, and 10 ones in Jerusalem. During these incursions, Israeli forces arrested at least 56 Palestinian civilians, including 11 children and 2 women. Twenty five of them, including 7 children and a woman, were arrested in occupied Jerusalem and its suburbs. In the Gaza Strip, on 14 August 2017, Israeli forces moved into East of al-Bureij in the central Gaza Strip. Israeli forces levelled and combed the lands adjacent to the border fence between the Gaza Strip and Israel. They later redeployed along the border fence. As part of the Israeli forces’ collective punishment policy against the families of Palestinian civilians who are accused of carrying out attacks against Israeli soldiers or/and settlers. On 10 August 2017, Israeli forces demolished 2 houses and closed a third one with compact cork in Deir Abu Mesh’al village, northwest of Ramallah, while they demolished another house in Silwad, northeast of the city, rendering the residents homeless. It should be mentioned that on 16 June 2017, the Israeli forces killed sons of the three families from Deir Abu Mesh’al when the former opened fire at the 3 Palestinians after carrying out a stab and shooting attack on al-Sultan Street and at the northern entrance to al-‘Amoud Gate in East Jerusalem. They also arrested Malek Hamed from Silwan village after accusing him of running over 2 soldiers on 06 April 2017 in the vicinity of ‘Ofra settlement established on the abovementioned village lands. On 16 August 2017, Israeli forces demolished a house belonging to ‘Omer ‘Abdel Jalil Al-‘Abed in Kobar village, northwest of Ramallah, who has been arrested since 21 July 2017 on grounds of carrying out a stab attack in “Helmish” Settlement, northwest of the city. In the context of house demolitions, on 16 August 2017, Israeli forces demolished 4 houses and 3 civil facilities in occupied East Jerusalem under the pretext of non-licensing. 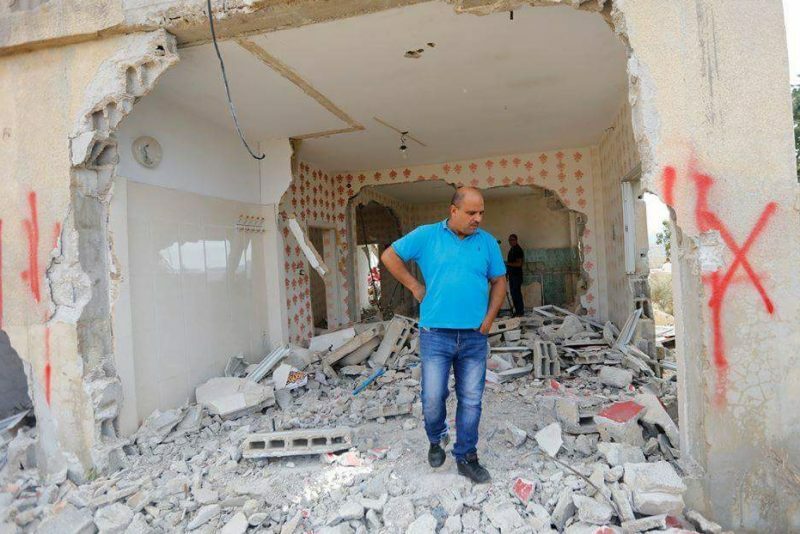 In al-‘Issawiya village, northeast of the city, Israeli forces demolished a 2-storey house belonging to Ahmed and ‘Abdullah Hamdan and two commercial stores belonging to Farouq Mustafa. In Silwan village, south of the city, Israeli forces demolished two houses belonging to ‘Abdul Karim Abu Isneinah and rented by the families of Nejem and Zaitoun. In al-Sal’ah neighbourhood in al-Mukaber Mount village, Israeli vehicles demolished a tent belonging to Um ‘Issa Ja’afrah in Beit Hanina, north of the city. They also demolished a car showroom belonging to Soliman al-Muthafar. In the context of house demolitions and notices, on 14 August 2017, Israeli forces demolished 3 houses and a sheep barn built of tin plates in Khashm al-Daraj village, southeast of Yata, south of Hebron. Those houses built of tin plates sheltered 3 families of 12 members, including 4 children and 7 women. It should be mentioned that those facilities were donated by GVC after the abovementioned families’ houses had been demolished. On 16 august 2017, Israeli forces demolished two coal manufacturing facilities, and more than 20 tons of coal, which were still in the manufacturing process, and 30 tons of wood and coal were seized in Ya’abod village, southwest of Jenin. At approximately 16:30 on Saturday, 12 August 2017, Palestinian civilians and International activists organized a protest in the center of Qalqiliyah. They made their way to “Eyal” crossing, northeast of Qalqiliyah. When the protesters approached the crossing, the Israeli forces fired live and metal bullets, tear gas canisters and sound bombs at them. As a result, Khalil Majdi Abu Samrah (17) sustained live bullet wound to the right leg and was arrested. Israeli forces also arrested Shukri Rasem Abdullah Shana’ah (14). They took the 2 children to an unknown destination. At approximately 15:30 on Friday, 11 August 2017, dozens of Palestinian young men made their way to the border fence between the Gaza Strip and Israel, east of al-Buraij in the central Gaza Strip, in response to calls for protests against the Israeli imposed closure on the Gaza Strip. A number of them set fire to tires and threw stones at the Israeli forces stationed along the abovementioned border fence. The soldiers sporadically fired live bullets and rubber-coated metal bullets at them until 20:00 on the same day. As a result, a 17-year-old child was hit with a bullet to the lower right knee while a 27-year-old civilian sustained shrapnel wound to the right hand. The two wounded persons were then taken to al-Aqsa Martyrs Hospital in Deir al-Balah, where their condition was described as minor. Both of them then left the hospital. At approximately 16:00 on the same Friday, dozens of Palestinian civilians gathered few meters away from the border fence between the Gaza Strip and Israel, east of Jabalia in the northern Gaza Strip, in response to calls for protests in the border area against the closure imposed on the Gaza Strip. A number of the young men set fire to tires and threw stones at the Israeli forces stationed along the abovementioned border fence. The soldiers sporadically fired live bullets, tear gas canisters and rubber-coated metal bullets at them until at approximately 20:00 on the same day. As a result, 5 civilians, including 4 children, were hit with tear gas canisters, and then taken to the Indonesian Hospital in Jabalia. One of the children’s injury was classified as serious as the canister made a hole in the head, causing skull fracture. He was then transferred to al-Shifa Hospital in Gaza to receive medical treatment. As part of the collective punishment policy applied by the Israeli forces against the Palestinian families of those accused of carrying out attacks against the Israeli forces and/or settlers, Today at dawn, 10 August 2017, Israeli forces demolished two houses and closed a third with compact cork in Deir Abu Mesh’al village, northwest of Ramallah, while demolished another house in Silwad village, northeast of the city, rendering their occupants homeless. A 1-storey house belonging to Hassan Ahmed Ankoush built on 110 square meters and sheltering a 10-member family. It was closed with compact cork. In the same context, at approximately 01:30, Israeli forces accompanied with several military vehicles and a digger moved into Silwad village, northeast of Ramallah. They surrounded a house belonging to Ahmed Mousa Hamed and totally demolished it. The 2-stoery house is built on an area of 150 square meters and sheltered 6 individuals, including an 11-year-old child. It should be noted that the abovementioned civilian is father of Malek Hamed (22), who was accused of carrying out a run-over attack against 2 soldiers on 06 April 2017, in “Ofra”settlement established on lands of the abovementioned village. At approximately 01:30 on Wednesday, 16 August 2017, Israeli forces backed by 20 military vehicles and accompanied with a digger and bulldozer moved into Kobar village, northwest of Ramallah. They then surrounded a 2-storey house belonging to the family of ‘Omer ‘Abdel Jalil al-‘Abed. The house was built on an area of 180 square meters, sheltering 7 members, including a girl with special needs. The Israeli vehicles immediately destroyed the walls of the ground floor, which was inhabited, while the second floor, which was under-construction, sustained severe damage. Meanwhile, the Palestine TV crew was covering the house demolition, so the Israeli soldiers deliberately fired rubber-coated metal bullets at the Palestine TV photographer, Mohammed Radi. As a result, he was hit with a bullet to the nose and then taken by an ambulance belonging to the Palestinian Red Crescent Society (PRCS) to Palestine Medical Complex in Ramallah for medical treatment. Local sources in the Complex said that the bullet fractured his nose. It should be mentioned that the abovementioned civilian has been arrested by the Israeli forces since 21 July 2017 on grounds of carrying out a stab attack in “Helmish” settlement, northwest of Ramallah that resulted in the killing of 3 settlers. The Israeli forces have also arrested his parents; 2 brothers, Munir and Khalid; and his uncle, Ibrahim al-‘Abed, accusing them of having prior knowledge of the attack. At approximately 15:00 on Sunday, 13 August 2017, Israeli forces stationed at Za’tarah checkpoint, south of Nablus, confiscated a bus belonging to al-Tamimi Transportation Company. The bus holds number (7012130) and is licensed to transport 50 passengers. The Israeli forces claimed that the bus was carrying rioters to the Israeli military checkpoints. At approximately 16:00 on Friday, 11 August 2017, Israeli forces arrested ‘Oday Iyad Bassam Za’aqeeq (15) and Raied Moqbil Moqbil (16), while they were in the vicinity of “Karmei Tsur” settlement, south of Beit Ummer village, north of Hebron. On Monday, 14 August 2017, Israeli forces beat up and arrested a Palestinian civilian, along with his daughter, from al-Zawiyia village, west of Salfit. The arrested persons were identified as Yaser ‘Asi al-Ghazawi (47) and his daughter Sojoud (17). Eyewitnesses said to PCHR’s fieldworker that at approximately 16:30, Palestinian young men, from al-Zawiyia village, saw Israeli soldiers on ‘Aber al-Samera Street beating up Sojoud with their feet and she was lying into the ground. The Eyewitnesses added that they saw Sojoud’s father running towards her, attempting to rescue her. However, the Israeli soldiers beat him up as well without allowing him to explain his daughter’s mental disorder. The Israeli forces then took Yasir and his daughter Sojoud to an unknown destination. It should be noted that Sojoud suffers from a mental disorder. At approximately 16:15 on Tuesday, 15 August 2017, Israeli forces established a checkpoint at the entrance to al-Zawiyia village, west of Salfit. They stopped Palestinian vehicles and checked civilians’ IDs. After that, the Israeli forces arrested Mazen Rebhi al-‘At’out (25), from al-Zawiyia village. On Wednesday, 16 August 2017, Israeli forces established a checkpoint at the intersection between al-Naqoura village and “Shavei Shomron” settlement on Nablus-Jenin Road. The Israeli forces stopped Palestinian vehicles and checked passengers’ IDs. They also arrested Haytham Fayiq Yousef (22), from Beir Basha village, south of Jenin. At approximately 11:00 on Wednesday, 16 August 2017, Israeli forces deploying in Hebron’s Old City neighborhoods arrested Mohamed Kayid Idreas (19), claiming he had a knife. Mohamed was then taken to a police station in “Kiryat Arba’” settlement, east of the city. At approximately 16:20 on Sunday, 13 August 2017, Israeli forces opened fire at Sabri Kashour (53) while he was in Beit Safafa village, south of occupied Jerusalem. As a result, Sabri was hit with a live bullet to the leg and then taken to “Shaare Zedek” Hospital in west Jerusalem, to receive medical treatment while being under arrest. Luba al-Samri, the Israeli police spokesperson, said that the Israeli police, along with the Israeli Security Agency “Shabak” arrested a Jerusalemite suspect, from al-Thawri neighborhood. She added that while arresting Sabri, the Israeli officers opened fire at him. As a result, he sustained minor wounds to the foot and then taken to the hospital, while he was under arrest. On Tuesday, 16 August 2017, Israeli bulldozers demolished 4 houses and 3 civilian facilities in occupied East Jerusalem under the pretext of non-licensing. In al-‘Issawiyia village, northeast of the city, Israeli vehicles demolished a 2-storey building built on an area of 110 square meters. The building belongs to two brothers Ahmed and Abdullah Hamdan. Mohamed Abu al-Humus, Member of Follow-up Committee in the village, stated that at dawn, over 400 Israeli soldiers moved into the village and forced the building’s residents and shops’ tenants in the ground floor to vacate their property. He added that the Israeli forces used heavy vehicles while demolishing the building, which includes a residential apartment and 2 shops. Abu al-Humus said that the abovementioned building was built 10 years ago in an area where construction is allowed and is surrounded by other buildings in the area; some of which were built from 80 years. Abu al-Humus pointed out that the Israeli Municipality refuses to issue structural maps of the village that enable residents to obtain construction licenses. Moreover, Israeli bulldozers demolished 2 commercial stores belonging to Farouq Mostafa in the eastern area of al-‘Issawiyia village. The 2 stores’ owner stated that a large force of Israeli soldiers accompanied with an Israeli Municipality bulldozer raided his land and then demolished two stores there. He added that the Israeli forces did not allow him to vacate the stores’ contents. Mustafa explained that the two 24-square- meter stores were built 7 years ago. He added that the Israeli forces demolished an agricultural facility belonging to him 2 years ago, which was built near the abovementioned two stores. It should be noted that since the beginning of this year, the Israeli forces demolished around 16 residential and commercial facilities in al-‘Issawiya village and there was around 200 houses threatened to be demolished as the Israeli forces handed the residents administrative demolition notices. In Silwan village, south of occupied Jerusalem’s Old City, at approximately 09:00 on Tuesday, Israeli bulldozers demolished 2 houses belonging to ‘Abed al-Kareem Abu Isneinah and rented by Najem and Zaytoun families. Mansour Nejem, one of the tenants, said that the Israeli forces forced him to leave his house without allowing him to get the contents out. Mansour said that his house was built on an area of 80 square meters, sheltering his wife and 6 children. He also said that he does not have another house to stay in it, so he will stay on the street until he finds another one. The two houses’ owner, Abed al-Kareem Abu Isneinah, said that he will rebuild the two houses as a challenge to the Israeli forces. In al-Sal’ah neighborhood in al-Mukaber Mount village, south of occupied Jerusalem, at approximately 11:00, Israeli bulldozers demolished a tent that shelters an elderly woman, Um ‘Isaa Ja’afrah. The tent was built 9 months ago after the Israeli forces demolished Ja’afrah’s house under the pretext of non-licensing. In Beit Haninah neighborhood, north of occupied Jerusalem, Israeli bulldozers demolished a car showroom belonging to Suliman al-Mudafar. Suliman stated that the Israeli forces raided his car showroom and forced him to vacate all cars and then starting the demolition. He said that last week, the Israeli Municipality handed him a demolition notice under the pretext of non-licensing. He added that this was the second time within 2 years that the Israeli forces demolish his car showroom which was built 15 years ago. On Tuesday, 08 August 2017, the Israeli authorities notified many residential, industrial and commercial facilities in Silwad village, east of Ramallah, under the pretext of non-licensing. It should be noted that the abovementioned facilities is located in (B) areas according to the 1993 Oslo Accords. The Chairman of Silwad village Municipality, ‘Abed al-Rahman Saleh, stated that Israeli forces accompanied with the Israeli Civil Administration officers moved into Silwad village. They handed 14 administrative demolition notices to owners of houses, facilities and a private school. He added that among the notified facilities, there was a private school located within Silwad village municipality. He also said that this school is the only school for the villages in the eastern side of Ramallah. A 70-square-meter dwelling donated by (GVC) and built of tine plates. The dwelling belongs to Salma Suliman Husain Tabnah (85), who lives in the house, along with her 3 daughters after demolishing her house 2 years ago. A 70-square-meter dwelling donated by (GVC) and built of tine plates. The dwelling belongs to Mousa Ahmed ‘Awaad al-Tebnah (49), who lives in the house along with his wife and their 3 children. A 70-square-meter dwelling donated by (GVC) and built of tine plates. The dwelling belongs to the sons of the late Salem Ahmed Tabnah, whose sons; Ibrahim (17); Khitam (20) and Hanan (19) live in it. A 40-square-meter livestock barn built of tin plates and belongs to Abdullah Ahmed ‘Awaad Tabnah (51). It should be noted that the abovementioned facilities were demolished by the Israeli authorities under the pretext of being located out of the village structural plan, which was announced in 2008. Furthermore, in 2000, the village residents prepared a cadastral plan of their lands to prove owning them. In 2007, the Israeli authorities accepted to grant the residents land of (2000 dunums) within the abovementioned plan, but the residents rejected this offer in order to obtain more lands than the offered ones. In 2008, the lawyer Qamar Mashreqi obtained the approval on this plan with an area of (2500 dunums). On Wednesday, 16 August 2017, Israeli forces accompanied with military vehicles and a bulldozer moved into al-Mashajer area in Ya’bod village, southwest of Jenin. The bulldozer demolished 2 facilities for coal manufacturing and seized a large amount of coal and wood. The General Director of Ya’bod Municipality, Yousef ‘Atatrah, said that the Israeli forces moved into the area and demolished 2 facilities for coal manufacturing belonging to Waleed al-‘Abadi and Subhi Zaid. Moreover, they damaged over 20 tons of coal in the manufacturing stage, in addition to seizing 30 tons of wood. Fully detailed document available at the official website of the Palestinian Centre for Human Rights. This summer, the Gaza Power Authority confirmed that the current electricity crisis in the Gaza Strip is the worst it has ever been, after fuel from Egypt was stopped and the Israeli electrical supply to the Gaza power lines was reduced, reportedly at the request of the Palestinian Authority. Gaza consumes currently more than 500 MW of power, while as recently as July, the quantities of electricity currently available in the Gaza Strip did not exceed 95 MW (approximately 2 hours per every 30), according to the Authority. lack of electricity, regular fallouts interfere with treatments. This has particularly negative effects for the dialysis section of the hospital, where an interruption in electricity provision leads to an interruption of the blood cycle rotation. “A further increase in the length of blackouts is likely to lead to a total collapse of basic services, including critical functions in the health, water and sanitation sectors,” he warned. The Gaza Strip is home to some two million people, more than three-quarters of whom the United Nations says depend on humanitarian aid. Power reductions come despite stark warnings of the humanitarian implications for Gazan civilians, who already suffer from critical shortages of power, with most homes receiving only a few hours even before the cut. 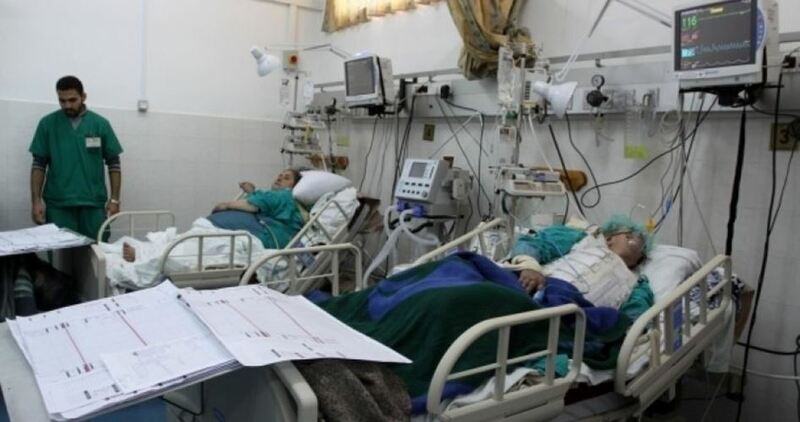 World Health Organization (WHO) revealed on Monday that Israel's so-called Coordination and Liaison Administration delayed in May half of the requests submitted by Gazan patients seeking treatment in the hospitals of the 1948 occupied Palestinian territories. Haaretz newspaper reported, based on a WHO report, that of 2,282 applications for permits to exit Gaza submitted in May, 47.2% were approved, 2.1% were rejected and 50.7% were delayed with no explanation causing the patients to miss their appointments for examinations. Among those delayed were 255 children under the age of 18 years and 141 patients aged 60 years or older, the report noted. The paper pointed out that in April 39% of the requests were delayed, which means that 776 patients including 178 children and 93 patients over the age of 60 were not able to leave the besieged enclave. The requests often belong to those who had previously received exit permits for treatment. WHO affirmed that the approval rate of patients' permit applications fell from 92.5% in 2012 to 62.1% in 2016. According to Haaretz, all those seeking permissions to exit the Gaza Strip through Beit Hanoun (Erez) crossing are patients whom the Palestinian Authority has allowed to leave Gaza and to whom it has pledged to cover the costs.